SKU: 2012084. 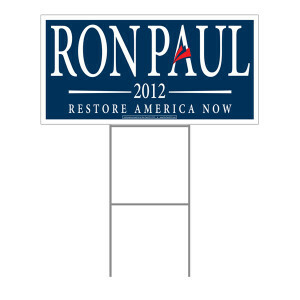 Category: Commemorative, Yard sign. Let your neighbors know you support Ron Paul for President with your Official Blue Ron Paul 2012 Yard Sign. This 14″ x 22″ corrugated plastic sign is printed on both sides and comes with an H-wire stake so you can plant it in your lawn.